Conspicuous by its absence is a phrase that springs to mind when it comes to Acer’s Nvidia BFGD, or Big Format Gaming Display. The mega monitor was first revealed back in January 2018, but at Acer’s Next event in New York last week it was still nowhere to be seen. Instead, Acer revealed the Predator CG437KP – another giant 4K, 144Hz HDR gaming screen, only this time it’s an adaptive sync monitor, not a proper Nvidia G-Sync Ultimate one. Is their Nvidia BFGD ever going to see the light of day? Here’s what they had to say when I questioned them about it last week. Admittedly, it’s been quite some time since we’ve seen or heard anything about Acer’s BFGD. It’s been absent at several big tech shows since its first unveiling in 2018, but with HP’s Omen X Emperium BFGD now finally out in the wild, I was hoping Acer might use their Next event to propel their own BFGD back into the public eye. Once again, however, the monitor was sidelined, with Acer telling me after the show that they still “only have one or two samples” of the thing to showcase it with any gusto. That makes me think it’s probably still stuck in the prototype stage, it will likely be some time before it sees the business end of a HDMI cable. It’s a shame, really, especially as Acer tend to use their Next event to go pretty big on some of their madder devices – see the bonkers Predator Helios 700 and its extendable keyboard, for example. They did have one monitor to show off, however: the snappily-named Predator CG437KP. And with its 43in, 4K, 144Hz, HDR display, it might just be a better option than paying north of five grand on something like the HP Omen X Emperium – especially when it’s currently slated to cost just $1299 / 1499€ when it launches this September (although I’ll admit that “just” is still a heck of a big “just”). Indeed, in many ways, the CG437KP is like a down-sized version of their proposed Predator BFGD. It’s a full-fat VESA-certified DisplayHDR 1000 screen, for example, with a peak brightness of 1000cd/m2, as well as 90% coverage of the HDR-grade DCI-P3 gamut. This means it’s going to be just as bright and colour accurate as the Emperium, and Acer claims its VA panel has a fast 1ms response time, too, so it shouldn’t suffer from noticeable lag, either. 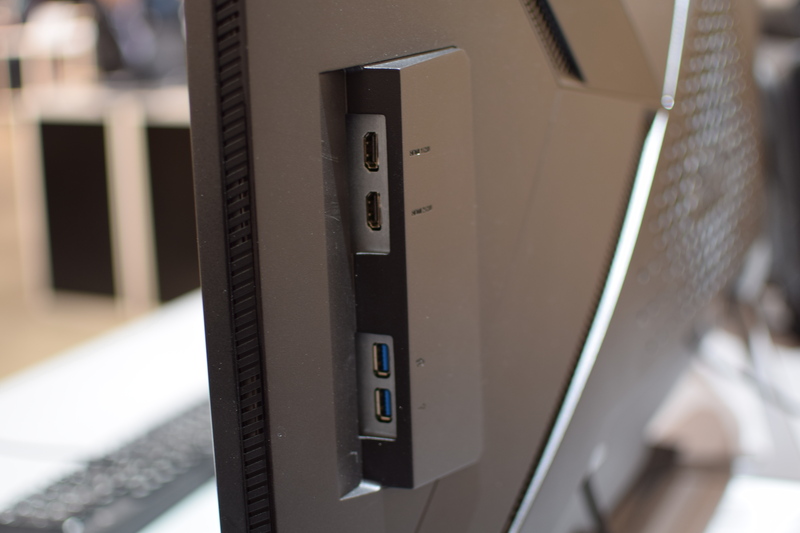 What’s more, this is an adaptive sync screen, which means AMD graphics card owners can take advantage of it in addition to those with Nvidia cards, making it a lot more flexible than HP’s Nvidia-only Emperium. Acer are also championing the CG437KP as a way to make high refresh rate play possible with game consoles, too – although unless you’ve got either an Xbox One X or PS4 Pro, the CG437KP is arguably overkill for the rest of today’s current-gen consoles. Plugged into a good PC, though, the CG437KP is a serious bit of kit. Acer had the demo unit set up with the keyboard and mouse pretty close to screen, which meant it was difficult to absorb the full 43in of display space. However, it certainly felt immersive and a 4K resolution is easier to appreciate at this size. 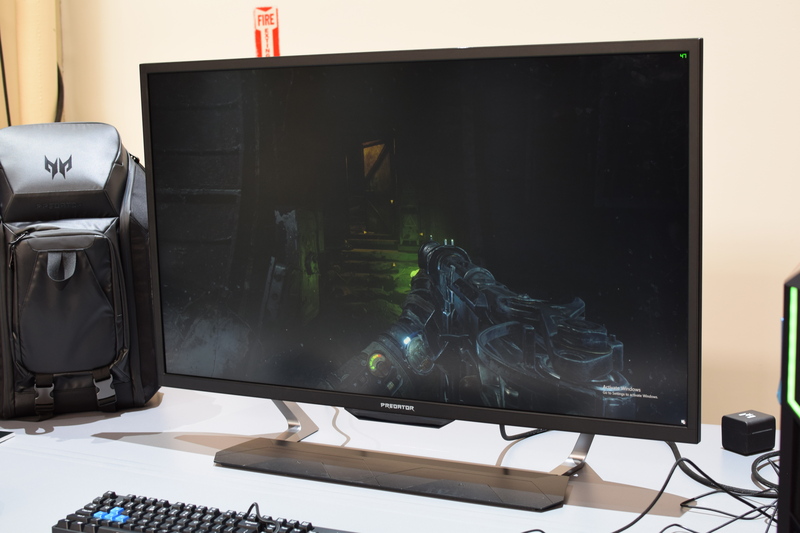 Metro Exodus was Acer’s game of choice to show off the CG437KP, and it looked pretty damn good, with details such dust particles in light shafts deftly picked out. Unsurprisingly, everything felt very smooth with adaptive sync enabled (even if the game itself wasn’t able to reach the full 144fps due to it being a right mare on the PC performance front), and I couldn’t detect any ghosting when zipping through the game’s menus. That said, the sequence Acer chose for their demo was an underground one, so while the blacks looked pleasantly deep, it was a tad difficult to see the display’s HDR in all its 1000cd/m2 glory. Colours seemed rich and accurate, but didn’t pop quite as much as I would have expected. Still, the CG437KP looks decent in the flesh. It’s chunkier than most 4K TVs, but most of its bulk is hidden round the back. The Predator branding is kept to a minimum, too, so I reckon the screen wouldn’t look too out of place in your living room instead of a more traditional TV. All in all, my first impressions of the CG437KP have left me quietly impressed – so much so that I’m not even sure we need Acer’s full-fat BFGD any more. 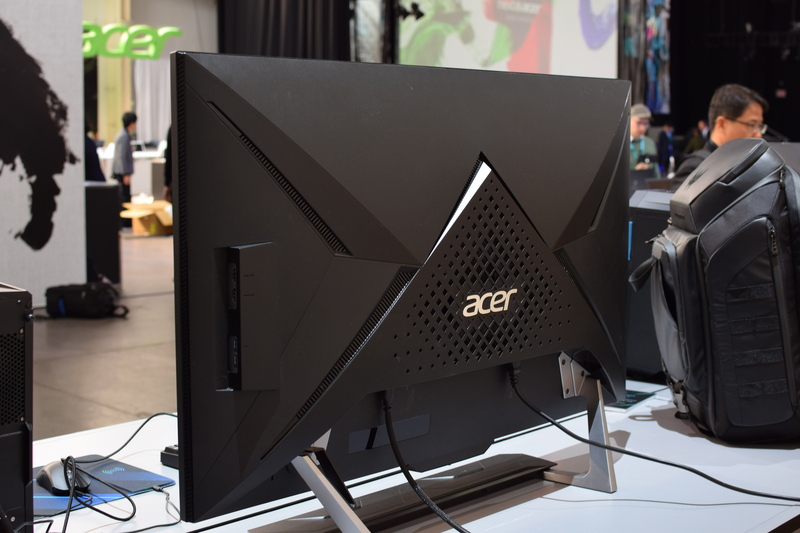 As long Acer can deliver the goods when the C437KP launches later this year, this could be the big screen gaming monitor we’ve been waiting for. Tagged with 144Hz, 4K, Acer, feature, FreeSync 2, Hardware, HDR, Monitors, Nvidia Big Format Gaming Displays.